Hi! Dana here today sharing the projects I created with the C'est Magnifique September Kits. I had a blast working with the Cocoa Vanilla Studio Hello Lovely collection. This collection is definitely on trend! I used items from the Main Kit, Flower Add-On, Embellishment Add-On and the Mixed Media Kit for my projects this month. 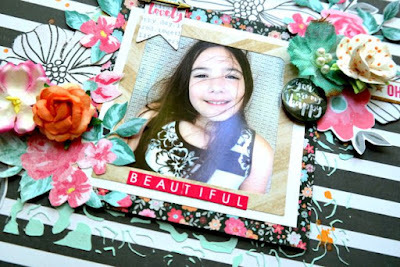 This layout features a photo of my oldest daughter, Claire. I mixed the C'est Magnifique Pale Peacock Paint from the Mixed Media Kit with Whipped Spackle and spread it over a Prima stencil to build up some texture on the background of this page. I then added a splash of bright orange using the C'est Magnifique Melon Mist from the Mixed Media Kit. I cut flowers from the patterned papers in the Main Kit and mixed them with die-cuts and flowers from the Embellishment and Flower Add-Ons to frame my photo. I found this quote on the bottom of one of the patterned papers from the Main Kit and loved it and just had to add it to this layout. 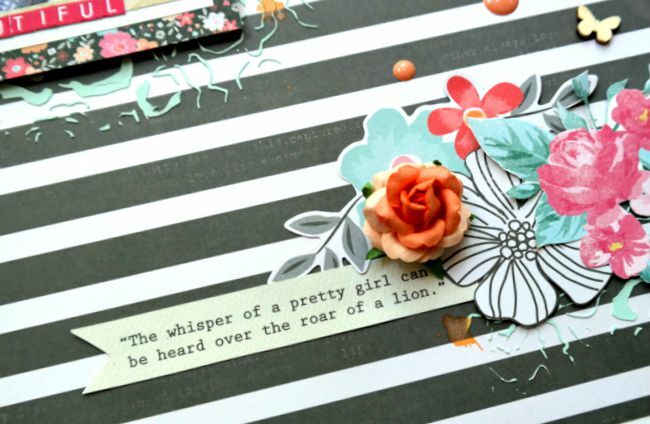 The quote reads; "The whisper of a pretty girl can be heard of the roar of a lion." This layout features a photo of my Niece Avalynn. She recently had her first ballet recital and was absolutely adorable in her costume! The embellishments in the kits are so fun! I surrounded my photo with a mix of die-cuts, wood veneer words, fussy cut designs, flowers, ribbon and lace. I cut several circle designs from the patterned paper and embellished them with enamel dots for a fun design element along the side of the page. This large white feather butterfly is one of my favorite items from the kit. It has a fantastic glittery sparkle in real life! I took this group of silly photos of my oldest daughter and my Nephew Dylan on a recent family vacation. These kids were two peas in a pod all week! This sweet boy looks so much like my brother it blows my mind. These photos really take me back to my childhood memories of all the great times I had with my brother. I created my own patterned paper with the Prima Crackle Stamp from the Mixed Media Kit and some black ink. I made the title spot with a die-cut, a fussy cut heart and a flower. This is my favorite layout of the bunch and features a photo of my sweet Niece Hadassah. I built this embellishment cluster with a colorful mix of fussy cut papers, die-cuts, flowers and sequins. I'm loving the blue/black/white/orange color palette of this page! I used the same paint and Whipped Spackle mix that I spread on my first layout here along with the stencil from the Mixed Media Kit. The text adds some fantastic subtle texture to the page. I really love the selection of small embellishments in this kit. They create a fantastic delicate design! This Fabric Word from Prima is one of my favorite embellishments in this kit and it pairs wonderfully with the polka dot prints present on several of the patterned papers. The Hello Lovely papers have a great patterned strip on the bottom of each page and I used them repeatedly in my designs like this black strip; it made a great anchor for my title spot! Thanks for stopping by today. I hope I have inspired you! I have one more layout to share for the September Sketch Challenge, so please stop by again on the first of the month. 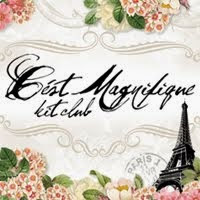 The September Add-Ons and the Mixed Media and Card Kits are available for purchase now from the C'est Magnifique Store. The September Main Kit will be available for purchase on August 31st. As usual great idea's on your LO!